The Cooperstown For Kids Travel Blog is the official blog of CooperstownForKids.com, a Web Site solely dedicated to helping plan your Cooperstown family vacation. We offer you Cooperstown travel recommendations straight-from-the-heart and from our travel experiences -- the way you would write if you were creating a Cooperstown travel site. Check back often for postings from our professional and citizen journalists! Article and photo (vew of Otsego Lake from the Bayside) by Eric H.
Our latest article at CooperstownforKids.com focuses on the Bayside Inn and Marina on Route 80 alongside beautiful nine-mile long Otsego Lake in Cooperstown, N.Y. Stressing the grand tradition of a family-oriented lake motel vacation, this article reveals the wonderful amenities offered at the Bayside like a swimming beach area with sand, free kayaks and canoes, cottages accommodating up to 10 people, well-kept motel rooms, a game room, fitness center, a family room with television and board games, a BBQ pavilion and, of course, the amazing lake and rolling hill views from just about every perspective. The Bayside is the type of traditional place people vacationed in during the 1950s, 60s and 70s. 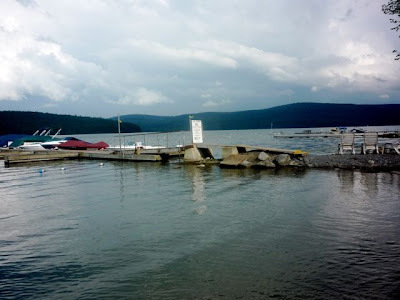 To this day, Cooperstown lake motels are quite popular amongst families interested in vacationing around Cooperstown. For us, the Bayside is a great choice for a lakeside vacation! To read the Bayside Inn article, click on the link near the top of the story. Labels: Bayside Inn, beach Cooperstown, Cooperstown, lake motel, lake vacation, N.Y. Fly Creek Cider Mill Pleases Lovers of Fudge! New York Pizzeria Comes to Cooperstown!